The Internet of Things (IoT) isn’t exactly new – according to The Guardian, the first Internet-connected toaster was unveiled at a conference in 1989, and does anyone remember the movie “Smart House”? People have been intrigued by the idea of connecting, well, anything and everything for years and years now! Today, however, we finally have the technology in place to do so, and the Internet of Things is really taking off. The Internet of Things revolves around increased machine-to-machine communication, and it’s said that this technology will make everything from streetlights to seaports “smart.” Its true value lies in the intersection of gathering data and analyzing it. Today, there’s a huge network of physical objects that are embedded with electronics, software, sensors and connectivity. These objects, or “things”, are able to both collect and exchange data, and the network will only continue to grow in coming years. In really simple terms, the Internet of Things is all about connecting devices and objects over the Internet. They are able to talk to each other and to us. There are plenty of examples already: smart technology in automobiles, the smart fridge, mobile devices, wearable technology, and so much more. And IoT isn’t even limited to singular devices. Imagine a true smart home, or an entire smart city! Security is always a top concern when new technology is introduced. It’s extremely valid, as devices within the IoT will certainly be gathering a lot of data about people. This is a challenge that experts in the Internet of Things are already working to overcome, and it’s still in the early stages. There have not yet been excessive hackings, but as IoT develops, it will be more attractive to hackers – this means more emphasis should be put on security in these early stages to avoid problems later. However, it’s important to keep in mind that these devices are just as susceptible as a home PC or smartphone – it’s all on an even playing field. And as the Internet of Things grows, so will security technology. Another concern is how the Internet of Things will affect business. Some think it will affect productivity levels or lead to an invasion of worker privacy. IoT will almost definitely impact how business is done today, but it can have a really positive impact. Manufacturing already uses the Internet of Things to organize and track machines, while farmers are able to monitor their crops and cattle. As more and more businesses adopt this technology, it can have a significant impact on production and efficiency. And while employees may not like the idea of being tracked throughout the workday, this concern may lead to the implementation of IoT policies to both protect workers and take advantage of the latest technology. The Internet of Things is built on cloud computing and networks of data-gathering sensors. Cloud-based applications are truly the key to using leveraged data gathered from the IoT. They interpret and transmit the data coming from all these sensors. The cloud provides the infrastructure needed to analyze these huge amounts of data in real time. 55% of IoT developers primarily connect devices through the cloud (Forbes). Cloud computing can also address concerns about security, as cloud security has strengthened significantly in recent years. 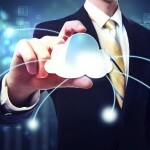 With huge levels of data flying around, the cloud is immensely important in the development of the Internet of Things. It has the capability to handle the speed and volume of this data, and ensures that the data remains accessible anywhere, at anytime, using any device. And paired with Big Data, cloud computing also provides valuable insights that businesses can use to customize their offerings.